After enjoying an awesome dinner with friends at the you-have-to-book-far-in-advance Kitima restaurant in Hout Bay we headed down to Pakalolo (a local bar) to meet up with friends. The bar (seen through the arch) has a beach/Mexican décor and atmosphere and often hosts live music and comedy shows. Pakalolo serves a variety of food, but appear to specialise in Mexican cuisine. 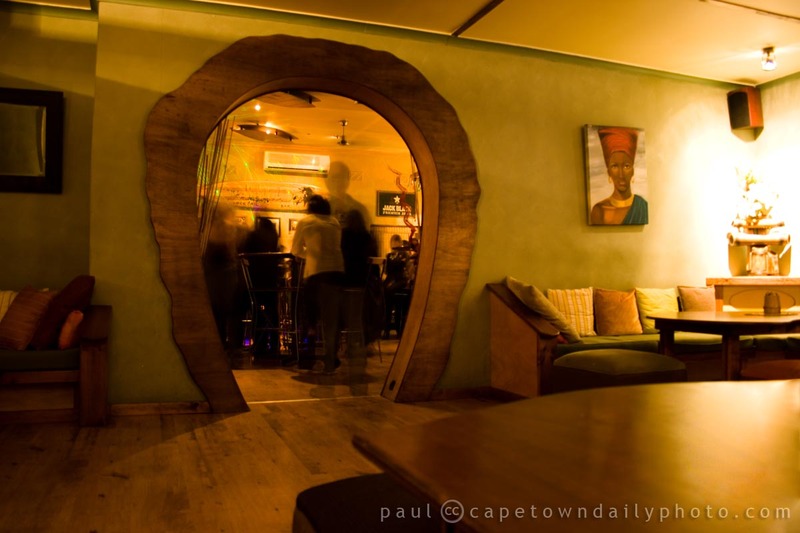 I can't say that the evening entertainment grabbed my attention, or that the bar and atmosphere was my scene - but I can imagine that it's an awesome place to sit back, relax and enjoy snacks and a couple of drinks after spending time on Hout Bay Beach. Posted in Activities and tagged bar, restaurant on Wednesday, 11 August, 2010 by Paul. Been to Hout Bay many times but not been in this bar, maybe we’ll give it a go when over there next time..